Steph's Travels: The weather is frightful. I think my car is underneath the 8 inches of snow we got yesterday. I'd curse the snow if it wasn't so beautiful. Have I mentioned I hate snow? 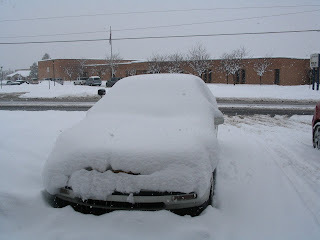 Especially having to dig my poor car out of the 2 feet of snow we have accumulated in the last 48 hours... ugh! You need to come by and meet T... plus, I need to get a pricing sheet from your muth... Yay for wedding stuff! oh my gosh. that is so much snow. i miss you, i texted you the other day, but my phone is goofy when it comes to functioning properly.